[S542] Index - New Zealand BDMs online, at http://www.bdmhistoricalrecords.dia.govt.nz/, Birth Reg. No. 1871/28895. [S542] Index - New Zealand BDMs online, at http://www.bdmhistoricalrecords.dia.govt.nz/, Death Reg. No. 1931/10153, aged 60. [S542] Index - New Zealand BDMs online, at http://www.bdmhistoricalrecords.dia.govt.nz/, Birth Reg. No. 1859/8196. 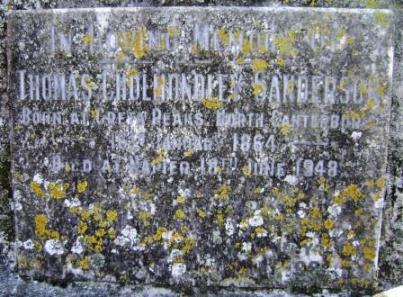 [S1147] Cemetery Marker - , Avonside Anglican Cemetery, Christchurch, NZ, Avonside Anglican Cemetery, Row X, plot 420. [S542] Index - New Zealand BDMs online, at http://www.bdmhistoricalrecords.dia.govt.nz/, Death Reg. No. 1892/5241, aged 33. [S542] Index - New Zealand BDMs online, at http://www.bdmhistoricalrecords.dia.govt.nz/, Birth Reg. No. 1866/19243. [S542] Index - New Zealand BDMs online, at http://www.bdmhistoricalrecords.dia.govt.nz/, Death Reg. No. 1949/30696, aged 84. He emigrated to New Zealand, leaving London on 27 February 1851 on the Steadfast (524 tons) which had been chartered by the Canterbury Association, and arrived in Lyttelton on the 8 Jun 1851, a voyage of 101 days. In 1853 Joseph returned to England hoping to become engaged to Emma, who was then finishing her schooling in France. They did become engaged and he returned to New Zealand. 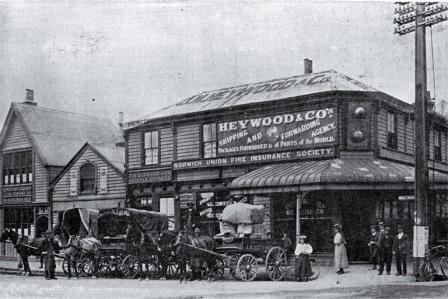 It appears he had travelled with two friends to New Zealand and that they set up a store which traded until at least Dec 1853 In Lyttelton. But in Jul 1855 notices appeared in the Lyttleton Times stating that the partnership between Edward Watson TIPPETTS, Alfred SILK and Joseph as storekeepers and general commission agents was dissolved by mutual consent on 25th March 1855. On his return to New Zealand he was involved in a number of entrepreneurial pursuits - first as Secretary to the Canterbury Land, Building and Investment Society (Oct 1857) and as manager for the Canterbury Steam Navigation Co (Mar 1858) which was engaged in the transport of goods along the New Zealand coast and for which he built a wharf at Ferry Rd. This gave him a natural benefit of providing storage facilities for the shipped goods. The family lived in Lyttleton until 1861 and then moved to Avonside and later to Armagh St W, Christchurch. Emma and Joseph visited England in 1864 where their daughter Katie was born, but unfortunately the child died 7 months later in July 1865 and was buried in the IVALL family grave in Kensal Green Cemetery. Emma and Joseph returned to New Zealand arriving in Dec 1865. Severe storms in the late 1860s meant that station owners were unable to pay their debts to Joseph (by then a merchant as well as a shipping agent). He, like others, became bankrupt and had to sell a piece of land in Hereford St, Christchurch that had been allocated to him when he emigrated. Joseph later paid all debts and retained his business. An active Anglican, he was by the late 1850s superintendent of the Sunday School at Holy Trinity, Lyttelton, later doing similar work at Avonside. In 1869 Bishop Harper licensed him as a lay reader and he was active in the Burwood-New Brighton area before priests were resident there. He paid for the design, in England, of a stained glass window for the eastern end of All Saints’ church, Burwood, although it had not arrived when the church was opened in 1877. He was a lay reader at West Melton, Sumner, Sunnyside Asylum and the Jubilee Home for the aged, and a founder and supporter of the Christchurch branch of the YMCA. [S871] FamilySearch, at https://familysearch.org/, England, Births and Christenings, 1538-1975, FHL film 374359. 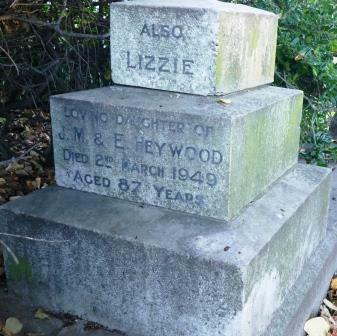 [S1109] IVALL One-Name study blog by Phil Taylor, at http://ivall.blogspot.co.uk, entry for Emma Heywood nee Ivall. [S1106] Newspaper - Lyttelton Times, issue of 21 Jul 1855, Vol V, issue 284, col1, p8, Notice; also in editions of 14 & 18 Jul 1855. [S1106] Newspaper - Lyttelton Times, issue of 1 Nov 1856, issue 417, Vol VI, p6, Marriage. [S1106] Newspaper - Lyttelton Times, issue of 24 Dec 1856, Vol VI, issue 432, p7, Shipping News. [S1106] Newspaper - Lyttelton Times, issue of 31 Oct 1857, Vol VIII, issue 521, col2, p2, Advertisements. [S1106] Newspaper - Lyttelton Times, issue of 3 Mar 1858, Vol IX, isue 556, col3, p5, Advertisements. [S1109] IVALL One-Name study blog by Phil Taylor, at http://ivall.blogspot.co.uk, Emma Heywood nee Ivall entry. [S542] Index - New Zealand BDMs online, at http://www.bdmhistoricalrecords.dia.govt.nz/, Death Reg. No. 1886/783, aged 51. [S1108] Book - Richard L N Greenaway, Avonside Parish Cemetery Tour, page 46. [S800] National Archives - NZ Archives (Archway), Christchurch probate record, Item ID R22389203, Agency CAHX, Accession CH171, box 140, record CH5121/1904. [S677] Index - England High Court of Justice, England & Wales National Probate Calendar, probate sealed in London via Supreme Court of New Zealand to William Henry HARGREAVES and Frederick Henry PYNE. [S542] Index - New Zealand BDMs online, at http://www.bdmhistoricalrecords.dia.govt.nz/, Death Reg. No. 1904/7444, aged 71. [S1108] Book - Richard L N Greenaway, Avonside Parish Cemetery Tour, Avonside Cemetery, row X, #419 (see p46). [S542] Index - New Zealand BDMs online, at http://www.bdmhistoricalrecords.dia.govt.nz/, Birth Reg. No. 1861/10802. [S542] Index - New Zealand BDMs online, at http://www.bdmhistoricalrecords.dia.govt.nz/, Birth Reg. No. 1862/12476. [S190] Index - GRO and Office of National Statistics, England & Wales Civil Registration Qtrly Indexes, Birth: District of Kensington, Vol 1a, p71, 1Q1865, mother's maiden name IVALL. [S542] Index - New Zealand BDMs online, at http://www.bdmhistoricalrecords.dia.govt.nz/, Birth Reg. No. 1868/26556. [S581] London Metropolitan Archives, at http://www.ancestry.co.uk, Paddington St Stephen, Register of Baptism, p87/ste, Item 002. [S581] London Metropolitan Archives, at http://www.ancestry.co.uk, Church of England Deaths and Burials, 1813-1980, All Souls, no. 41831. [S542] Index - New Zealand BDMs online, at http://www.bdmhistoricalrecords.dia.govt.nz/, Death Reg. No. 1949/18024, aged 87. [S419] Christchurch City Council Cemeteries database, at http://librarydata.christchurch.org.nz/Cemeteries/, Woolston Cemetery, Block S, plot 28. [S542] Index - New Zealand BDMs online, at http://www.bdmhistoricalrecords.dia.govt.nz/, Death Reg. No. 1964/38618, aged 95. [S542] Index - New Zealand BDMs online, at http://www.bdmhistoricalrecords.dia.govt.nz/, Marriage Reg. No. 1916/3215. [S542] Index - New Zealand BDMs online, at http://www.bdmhistoricalrecords.dia.govt.nz/, Birth Reg. No. 1890/6191, son of Thomas and Mary Jane. [S542] Index - New Zealand BDMs online, at http://www.bdmhistoricalrecords.dia.govt.nz/, Death Reg. No. 1965/43637, aged 75. [S542] Index - New Zealand BDMs online, at http://www.bdmhistoricalrecords.dia.govt.nz/, Marriage Reg. No. 1918/580. [S542] Index - New Zealand BDMs online, at http://www.bdmhistoricalrecords.dia.govt.nz/, Birth Reg. No. 1897/6011, daughter of William Harrison and Mary Jane HILL. [S911] Newspaper - Christchurch Press, edition of 20 Mar 1918, Women's Corner, p2, col5. Note this article says Frederick (Mayor of Brunnerton) is the 2nd son of Mr W Williams, Daisy being the 4th daughter of Mr R Hill of Dobson; best man was Mr Percy Williams. [S542] Index - New Zealand BDMs online, at http://www.bdmhistoricalrecords.dia.govt.nz/, Death Reg. No. 1959/34783, aged 62. [S580] Book - Nola Towgood, Samuel Williams, Old Church of England ground, plot 1115. [S917] GRO Scotland, marriage record, District of Blythswood, Statutory Marriages, GRO 644/10 2061. [S612] GRO Scotland, birth/bapt record, District of St Rollox, Statutory Births, GRO 644/4 878, mis-indexed under HINSHELWOOD. [S918] GRO Scotland, death record, District of Cambuslang, Statutory Deaths, GRO 627/00 0103, aged 29.